Below are the front and back panels to the Micro Change Camera Robo. 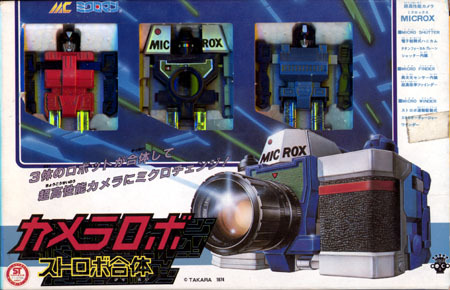 As can be seen on the back, the Camera Robo was actually comprised of three separate robot figures which interlocked to form a camera. And not just any camera! This camera was capable of searching out and unmasking the evil Acroyear enemy! Each of the three robots have a separate non-firing weapon which fits in their respective hands. In camera mode, you are able to attach a flash that can act as a missile launching weapon as well as a zoom lens which can also act as a weapon. 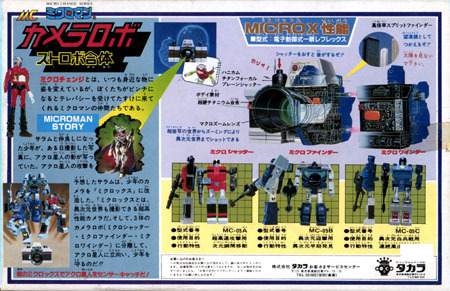 This piece seems to have shown up later in the Transformers line as a super rare mail-away Transformers set. I recently saw one in Toy Shop advertised for $475.00! It is the exact same toy as shown below!